In this series, you will revisit some of your favorite "fairy tale" stories from the past with a new and "grown up" perspective. As these champions of the Old Ways struggle to bring magic back to Britain, you will find yourself immersed in their sacred, and sometimes dangerous, world. I highly recommend this book as I was swept away from beginning to end. I can't wait to read the next book in the series!! 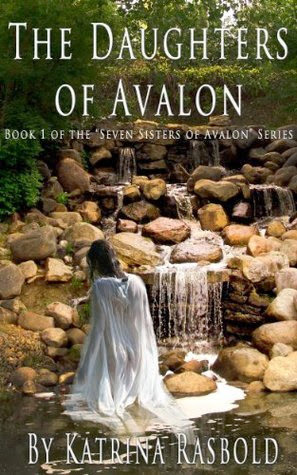 Katrina Rasbold is a masterful storyteller and I felt like I was in Avalon. Katrina Rasbold has provided insightful guidance to countless individuals over the past three decades through both her life path consultations and her informative classes and workshops. She has worked with teachers all over the world, including three years of training in England and two years of practice in the Marianas Islands. She is a professional life coach who holds a PhD in Religion. She and her husband, Eric Rasbold, are the founders of CUSP (Climbing Up the Spiral Pathway), a program designed to manifest positive, long term life changes by following the ancient agricultural cycles throughout the year. CUSP has touched the lives of literally thousands of people since its inception in 1997 and is practiced as a life pattern and spiritual path all over the United States and in other countries as well. Their book "The CUSP Way" explains the details of this vibrant and productive process of personal manifestation and is coupled with other books from the Bio-Universal/Energy Magic series to instruct users on how to use their own empowerment and that of The Divine to improve their life. Katrina was a frequent guest on the "Herb Nero Show" in Southern California and has been a popular presence at many festivals and speaking events throughout California for many years. She is a published author and freelance journalist who has distinguished herself with her no-nonsense approach and humorous, home-spun commentary in many different genres of reporting and commentary. Her workshops, classes and lectures continue to charm and educate her clients and students. In her book "Energy Magic," she coined the phrase "bio-universal energies" to identify the measurable energy fields a person radiates when creating positive change, a combination of the personal energy inherent to each individual joined with the universal energies that are able to be accessed and channeled into perceivable manifestation. As a life coach, Katrina has provided valuable guidance to literally thousands of people, including actors Jill Larson, Lee Meriweather, Michael E. Knight, and Bobbie Eakes. Since 2002, Katrina has worked as event staff for the General Hospital Fan Club Week, the single biggest General Hospital fan event of the year. Her guidebook "The GH Fan Club Weekend For Dummies", enjoyed strong popularity since its debut in 2002 and is now available as an e-book on Amazon.com, currently titled "An Insider's Guide to the General Hospital Fan Club Weekend." A lifelong fan of the show, Katrina brings her personal stories, photographs, and experience to the task of prepping guests to successfully navigate this fun-filled event. Her passion for Women's Wisdom studies began in 1980 when she became a certified childbirth instructor. She taught childbirth, prenatal and lactation classes in many locations around the world over the following 17 years and pursued practice in hospital, birthing center and home birth environments. A native of Western Kentucky, Katrina considers herself to be a true Southern Diva and enjoys such amenities as "big hair" and blessing a person's heart. Her book "Leaving Kentucky in the Broad Daylight" details her life growing up in rural Kentucky amongst an eccentric family in the 1960s-1970s. Katrina has been an avid practitioner of the magical arts since the early 1980s and the study of all ways that humans enjoy congress with God is her passion. She currently teaches classes in the Sacramento and El Dorado County areas of California. Katrina is happily married and has six children, to whom she personally gave birth. She lives on a remote mountain top in California with her husband, two of those six children (the rest are grown), two cats, three dogs, a turtle named God, several chickens that are all named Helen, and Elvis, a slightly neurotic shih tzu.